Monday seems like a great time to talk about coffee. If you’ve ever seen one of the cunning devices pictured here, you may know it as a coffee plunger or a French press. Many people have one, but few know how to use them. Fortunately, it’s easy enough to learn. 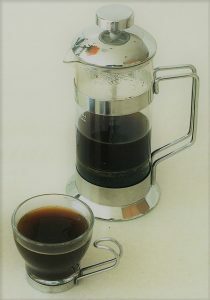 The device itself has many other names: press pot, coffee press, cafetière, and сafetière à piston. Ooh la la! Is that French enough for you? It has only been around since 1929, but it is pretty damn portable and versatile. It’s not so complicated to use, but there are a few tricks that make a huge difference. Firstly, find a vendor that can grind the coffee beans for you. In fact, do this regardless of how you make your coffee. Some grocery chains have coffee stations at specific stores. So you don’t need to buy expensive coffee from a fancy coffee shop to get the benefits. When you ask them to grind the coffee, tell them what device you plan to use. If you use a plunger, you need roughly ground beans. This is crucial if you want to have a great cup of coffee without a mouthful of sludge at the end. Grinding the coffee takes some practice, because you need to get it the correct size. If it is too fine, it will go through the sieve at the bottom of the plunger section. (In which case, surprise coffee sludge!) And if it is too rough, you won’t get the full flavour of the coffee. Secondly, only buy as much coffee as you need. Avoid buying more ground coffee than you can use in a month. (For bonus points you can buy a small electrical or hand-grinder if you want it SUPER fresh. But not everyone can afford to buy or store that many kitchen utensils, and it’s not essential.) Best of all, it means your coffee will be fresher when you buy it. And it won’t have time to go stale before you buy more. Add one heaped tablespoon of ground coffee for each mug you want to make. Once you’ve added the coffee to the pot, pour enough boiling water over it so that this only covers the coffee. You may need to stir it once or twice to make sure all the coffee grounds are wet. Leave the coffee grounds to soak for a minute or two, then add the rest of the boiling water. It’s best to measure the water to add only as much as you need for the number of cups. Be careful not to overfill the plunger. Leave the coffee for about 10 minutes. Otherwise it wont have enough time to brew and you’ll end up with watery coffee, which should be illegal. Press the plunger down gently, and make sure that the grill is at the front near the spout before you pour it. You can read more about this delightful device on Wikipedia. Two words of warning, though. Don’t believe their claim that 2-5 minutes is long enough. Also, if you use the same French press to make coffee and strain shellfish, you’ll regret it in perpetuity. P.S. This post is for one of my colleagues, who insists the whole process is too complicated for them. How’s about it, Roger?